1. Preheat the oven to 200ºC, gas mark 6. Grease a small ovenproof dish. 2. Heat the butter in a small frying pan and add the leeks. Cook for 5 minutes until softened. Meanwhile, heat the sauce in a pan or microwave according to the packet instructions. 3. Stir together the Gruyère and breadcrumbs. Spoon the leeks into the bottom of the dish and lay the fish fillets on top. Pour over the warmed watercress sauce then scatter over the breadcrumb and cheese mixture. 4. Bake for 15 minutes until the fish is cooked through and the breadcrumbs are golden brown. 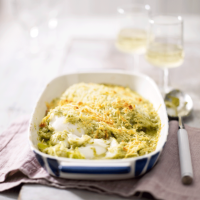 Serve with mash and your favourite steamed green vegetables. For extra crunch and a nutritious boost, add a handful of pumpkin seeds through the breadcrumb and cheese mixture before scattering over the fish.